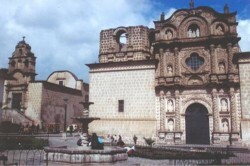 The department de Cajamarca is characterized by slight slopes and highlands relatively low in comparison to the rest de the Peruvian Andes. The territory is made up of numerous valleys and gorges. The city de Cajamarca brings together three ingredients that make it an unforgettable destination: a magnificent Colonial architecture, beautiful countryside, and a rich history since it was the scene de an important episode de South American history. Here, the Conquistador Francisco Pizarro captured the Inca Atahualpa who, in spite de fulfilling his part de the ransom, was killed. From that point onward, the conquistadors drafted the city in the traditional Spanish way, and today the Colonial constructions de the Cathedral, the churches de San Francisco, Belen, and la Recoleta, mansions, and monuments are preserved. There are many excursion possibilities: the Inca Baths, thermo-medicinal hot springs where the Inca used to go after long trips, the Ventanillas de Otuzco (Otuzco Windows), a cemetery carved into a wall de volcanic rock, Cumbemayo, a demonstration de pre-Incan hydraulic engineering still functioning today, that is located in a wonderful natural area, the old hacienda La Colpa, where the cattle go to be milked at the sound of their name, Kuntur Wasi, a commercial center that dates to the year 1100 b.C. and its site museum with the numerous examples de the oldest objects de gold in the Americas, the Porcon farm, an agricultural and cattle cooperative surrounded by a pine forest, ideal for spending a day out de the city, visiting its small zoo de vicuñas, deer, little spotted cats, monkeys, and eagles, buying its milk products, or simply enjoying the landscape.